Co-founder of the Polish School of Posters; poster and graphic artist, book illustrator, born on 9 September 1931 in Katowice. Died on 27 November 2013. Poster and graphic artist, book illustrator, born 9th September 1931 in Katowice. Świerzy is noted for the jacket designs of the excellent Współczesna Proza Światowa / Contemporary World's Prose literature series published by PIW as well as for record sleeves, calendar and post stamp designs. He has designed the artwork for the Polish pavilions at the International Fairs in New York, Leipzig, Vienna, Casablanca and Poznan. He studied at the Cracow Academy of Fine Arts (Faculty of Graphic Arts in Katowice) in 1947-52. His professors there were Rafal Pomorski (painting) and Jozef Mroszczak (graphic arts). In 1965 he was appointed Head of the Graphic Design Studio at the National Higher School of Fine Arts in Poznan. In 1970 he gave a series of lectures on the graphic arts in Havana. In 1979-80 and 1985 he lectured respectively at the University of Mexico and the Hochschule der Kunste in West Berlin. In 1979 he was appointed Chairman of the International Poster Biennial in Warsaw and in 1994 was made Head of the Poster Studio at the Warsaw Academy of Fine Arts. In 1959 he won Grand Prix Toulouse-Lautrec at the 1. International Film Poster Exhibition in Versailles for the Czerwona Oberża / The Red Inn poster, followed by the third prize for Dwa piętra szczęścia / Two Stories of Happiness at the same event in1962. In 1970 he received the 1st prize at the 10. Biennale de Sao Paulo and in 1975 and 1985 his posters for Ziemia obiecana / The Promised Land and Psy wojny / The Dogs of War earned him the first prizes at the "Hollywood Reporter" Key Art Awards Competition. A recipient of an honorary doctorate from the Cracow Academy of Fine Arts in 1997, he is also a member of the prestigious Aliance Graphique Internationale (AIG). His works are in the collections of the Stedelijk Museum in Amsterdam, Kunstbibliothek in Berlin, Ermitage in St Petersburg, Institute of Contemporary Art in London, National Museum in Poznan, Wilanow Poster Museum and in a number of other prestigious museums in Poland and abroad. Świerzy, who belongs to the select group of Poland's finest poster artists, was one of the founders of the Polish school of posters in the 1960s and 1970s. He says that that the choice of his future profession was influenced by his studying under the excellent graphic artist and teacher Jozef Mroszczak. It was him who talked Świerzy, then freshly graduated, into moving to Warsaw to take a job at the graphic section of Wydawnictwo Artystyczno-Graficzne, a state-owned art publishing house (nota bene, Świerzy remained with Wydawnictwo for many years). Świerzy has so far produced more than 1,500 posters - a number which is impressive and may make him the record holder. 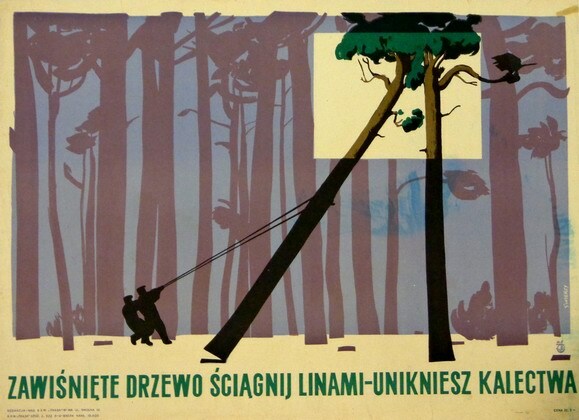 Many of them have been tremendously popular; the 1954 Mazowsze poster has had a million copies. While his main focus has been culture (theatre, film, circus and music), he has not shunned social and sports themes. After graduation he honed his technical skills and looked for a style of his own. His early works put a premium on graphics rather than painting, with the human figure serving as a starting point to build the sign. 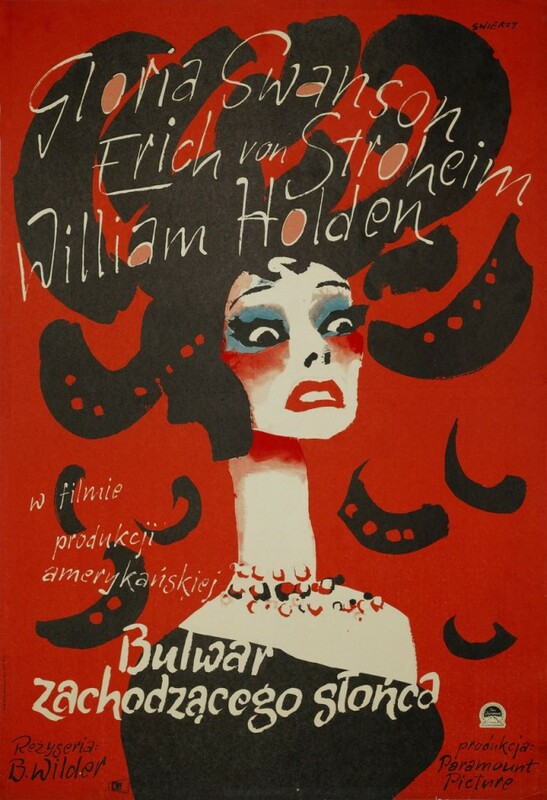 Simple in form and modern in typography, some of his 1950s film posters are now considered world classics, notably Czerwona oberża / The Red Inn (1955), in which Fernandel's comic face is grotesquely elongated, Bulwar zachodzącego słońca / Sunset Boulevard (1957) and Ulica Hańby / Street of Shame (1959). 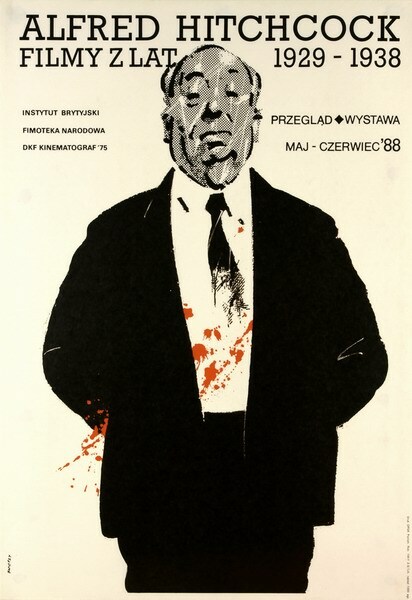 Incidentally, the Fernandel poster heralds a portrait series that was to dominate Świerzy's poster art from the 1970 onwards. In the mid-1950s his technique visibly changed to become more painting-like. The composition of his posters acquired a new dynamics - as if their form was exploding from the inside. This change was influenced by the new trends in painting, especially in the branch of abstract painting which supported spontaneous expression. Świerzy was the first to introduce elements of painting to poster art - and has remained forever faithful to them. This may explain why his posters are invariably easy to recognize despite their stylistic diversity. He has an extraordinary ability to combine unrestricted painting with a clarity of the graphic sign. Over time his posters start to echo the painting of gesture, lyrical abstraction, Art Nouveau and, more than anything, pop-art. They also betray inspiration drawn from areas as distant from applied graphic arts as folk art, naive paintings, amateur paintings and comic strips. A master of building an organic whole from what seems like clashing elements, Świerzy has used these inspirations to develop a distinct, original style. A case in point is his poster to Hej kolęda deska (1968), a song by the group No To Co, in which he applied pop-art to a folk theme. Świerzy applied a number of styles simultaneously, depending on the requirements of the subject-matter. His 1969 poster Auf Jagd nach Polen, intended to encourage foreign tourists to hunt in the forests of Poland, shows a beautiful stag standing between two birches against the backdrop of a kitsch, mushy sunset landscape. A variety of styles went hand in hand with a significant broadening of Świerzy's techniques, gouache now complemented by water colours, crayons, pencil. He would often use several techniques in a single project. In 1970 a circus poster of his created a sensation. Viewers' attention was caught by the red face of a clown in a blue bowler hat; those in the know identified him as WAG's editor-in-chief Woydylla. From then on Świerzy's poster art was to be dominated by human figures and portraits, possibly due to the influence of hyperrealism and figuration, then the prevalent trends in art. Poster portraits of musicians (for instance the famous series Great Jazzmen, including Duke Ellington and Louis Armstrong) brought Świerzy international fame, and his Jimmy Hendrix poster was a teenager cult object for years. Świerzy's "music" works also include record sleeve designs, mostly published in the United States, with music by Prokofiev, Liszt, Beethoven and other composers. All in all, he has portrayed over 250 people from the artistic world - painters, sculptors, composers, musicians, filmmakers. Some, like the images of Piotr Potworowski, Tadeusz Brzozowski and Stanisław Teisseyre, are truly unforgettable. Świerzy has found the portrait a genre of unlimited possibilities. Rather than focusing on the models' psychological depth, he concentrates on a few characteristics and uses metaphors to indicate the profession or the art. 1980s saw him arrive at an expressionist painting poster style. Equalling the form of poster with the form of painting, this style has continued up to the present. What sets it apart - besides vivid colors - is a particular dynamics targeted at the hurried viewer whose perception of the street poster is likewise hurried. From close up these posters resemble a multi-colored mish-mash of abstract items such as pasta-like lines, splashes, smudges, spots, dots and streaks giving the impression of randomness. They become legible only when seen from a certain distance, the gay mish-mash then revealing a human face or figure, and the artist's intention becoming clear. Powerful color combinations, expressive color spots, sensuousness, vitality, dynamics and virtuosity of form are the hallmarks of Świerzy's style.